Since this year St. Patrick’s Day falls on a Monday (tomorrow), it’s being referred to as St. Patrick’s Weekend. And what better way to celebrate than with beer that actually comes directly from Ireland. To help Toronto kick off the Irish celebrations, GUINNESS Canada handpicked two Dubliners to bring to Toronto to teach us how to celebrate the Irish way, visiting a few pubs including the Irish Embassy pub in downtown Toronto and Ceili Cottage in Leslieville. Dubliner Mark Rossiter, a proud Irish barman with the nickname “Happy”, and David Tunney, a 5th generation Dubliner helped us kick off St. Patrick’s Weekend. Rossiter is referring to Guinness’s campaign during last year’s St. Patrick’s Day festivities, “Friends Don’t Let Friends Drink Green Beer”. Say “sláinte” to real Irish brews such as GUINNESS. Or try a traditional Irish breakfast: eggs and bangers (Irish sausage), grilled tomato, and rashers (Irish bacon). Toronto is home to a number of Irish pubs. Check out the GUINNESS St. Patrick’s Weekend City Guide to find your local Irish spot. Traditional Irish song and dance is a great way to let loose and celebrate St. Patrick’s Weekend responsibly with your friends. 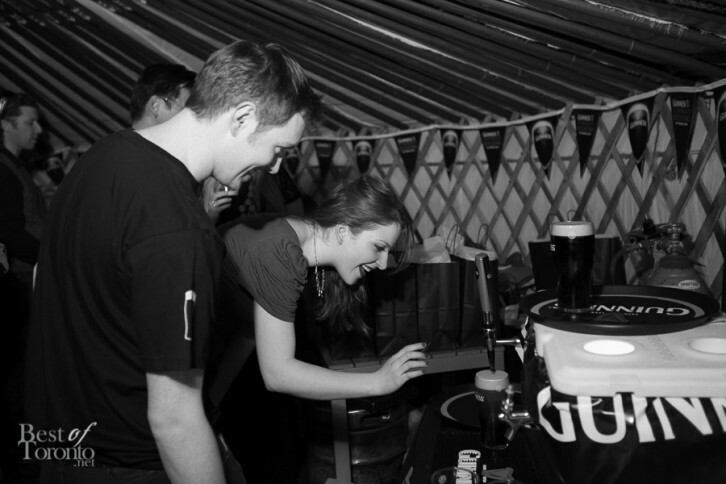 Thanks to Guinness and Ceili Cottage for treating us to a great Irish St. Patrick’s celebration in a cozy Yurt with oysters (including some from Ireland), bison meatballs with the Guiness ambassadors showing how to pour the perfect Guinness. Sláinte! "@Kym_Geddes: Not a big fan of the green beer, but I am a fan of raising a pint of the Black @ceilicottage #outstandinghospitality"